Set in 1914, young linguist orphan named Milo Thatch buries himself in books trying to unlock the secret to the destruction of Atlantis. Althouth his theories are ridiculed by his colleagues he is persistent in his dreams of one day discovering the lost isle. His dreams are realized when he is given a spot in an expedition, financed by a friend of his grandfather, to go in search of Atlantis following Milo's guide: The Shepard's Journal. But the Guardians of Atlantis await the explorers putting them in danger at every turn. And the deadly truth about Atlantis's demise puts Milo, the royal family, and all of Atlantis in mortal jeopardy. 1914: Milo Thatch, grandson of the great Thaddeus Thatch works in the boiler room of a museum. He knows that Atlantis was real, and he can get there if he has the mysterious Shephards journal, which can guide him to Atlantis. But he needs someone to fund a voyage. His employer thinks he's dotty, and refuses to fund any crazy idea. He returns home to his apartment and finds a woman there. She takes him to Preston B. Whitmore, an old friend of his Grandfathers. He gives him the shepherds journal, a submarine and a 5 star crew. They travel through the Atlantic ocean, face a large lobster called the Leviathan, and finally get to Atlantis. But does the Atlantis crew have a lust for discovery, or something else? 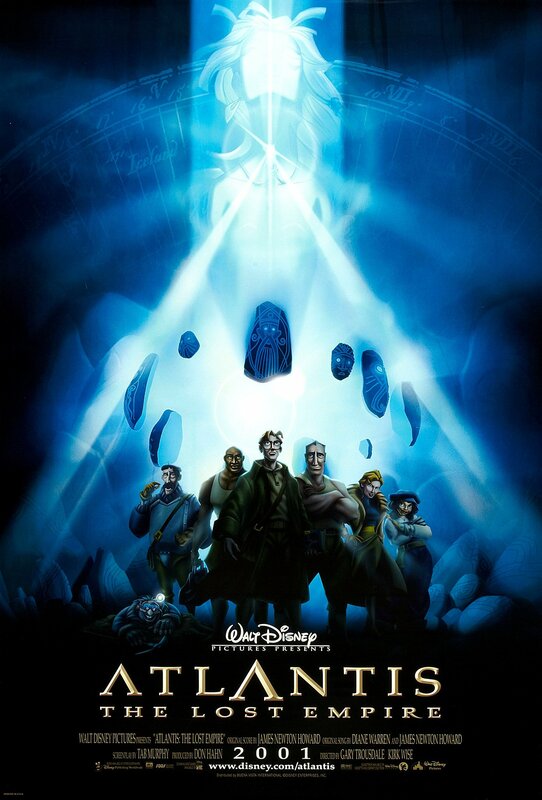 After barely recouping its cost upon its initial release, Atlantis: The Lost Empire (2001) has become a cult film. I personally always liked it. It was the first film I saw in theaters. I owned the PS1 video game and treasured my own McDonalds Happy Meal crystal for years. To this day, I have a soft spot for its dieselpunk vibe, its epic musical score, and its boldness to try something new; however, I would never say that this is a good movie. Atlantis' characters are one-dimensional, save for Milo. The villains are uninteresting, from their character designs to their one-note personalities The story is uninspired and full of holes. Even the angular animation style looks rather unappealing at times. I'm glad this film has garnered a small fan base, but it's not hard to see why it hasn't ever become more than that. this is really a great movie! It's not logical or something, but the character are great, the voices are brilliant and the animation!! wooohh... even the music is very nice! Another good disney production. The character designs, however, are much less impressive. Except for the oddly naturalistic Sinclair, the rest look like cartoony characters from one of Disney's '60s films. They are called coelacanths, a primitive order of fish once thought to be extinct. The first live specimen was caught off the coast of South Africa in 1938, 24 years after the events depicted in the movie. However, it is entirely feasible that Whitmore, a collector of rare artifacts, could have gotten a hold of a few specimens before anyone else. According to the DVD audio commentary, he was blinded when the Heart of Atlantis is activated and sinks the city. If you notice, his eyes are normal when he tells young Kida to look away in the opening sequence. One of P.T. Barnum's famous quotes is, "There's a sucker born every minute." Rourke is referring this quote regarding how the crew have chosen to supposedly withdraw from a lucrative deal and seem to be siding with Milo. The Leviathan was speculated to be a mythical sea-monster to frighten the superstitious which Milo quoted from the book of Job from the Bible . In actuality, it was a very powerful Atlantian warship. Before Atlantis was sunk, many Leviathans were once part of the Atlantian navy. The producer of the film stated that only one of the many Leviathan's survived the "Great-flood" and the last remaining one, which was seen in the film, was tasked with guarding the secret entrance to Atlantis.